My bestie, Tash, has had a terrible flu the past week. She asked me if I could recommend anything to her that might help her towards a speedy recovery. I swiftly told her Apple Cider Vinegar! Then she asked me what are the benefits.. I have read them before but didn’t remember… so since people are getting sick a lot lately I thought I would do a post on why Apple Cider Vinegar is so AH-mazing!!! 1. Balance your body systems – Apple cider vinegar helps the body maintain a healthy alkaline pH level. This is especially key if you like coffee or alcohol, drinking the Apple Cider Vinegar will help detoxify your insides. 2. Get your shine on! – Rinse your hair with Apple Cider Vinegar, once a week in the shower for shiny locks. 3. Soothe a sore throat – Drinking apple cider vinegar kills bacteria in the throat. So if you start to feel a tickling in your throat, gulp some down. All in all, I feel that Apple Cider Vinegar is a miracle cure. Nearly every part of your body can receive benefits from sipping on the vinegar every day. 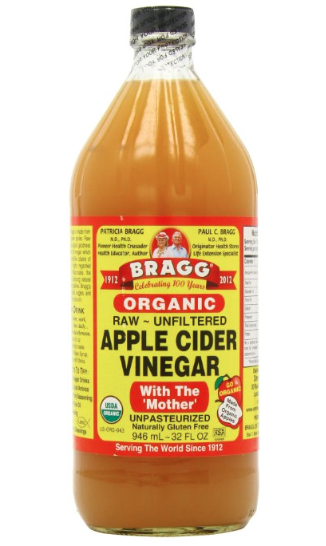 Make sure you get the Apple Cider Vinegar with the mother in it! My favorite is Braggs…(seen below). How I like to drink it – Hot or cold usually depending on the weather or time of day. I add about a shot or two of A.C.V with a squeeze of lemon and about 6-9 oz of water. I hope you enjoy and stay well!